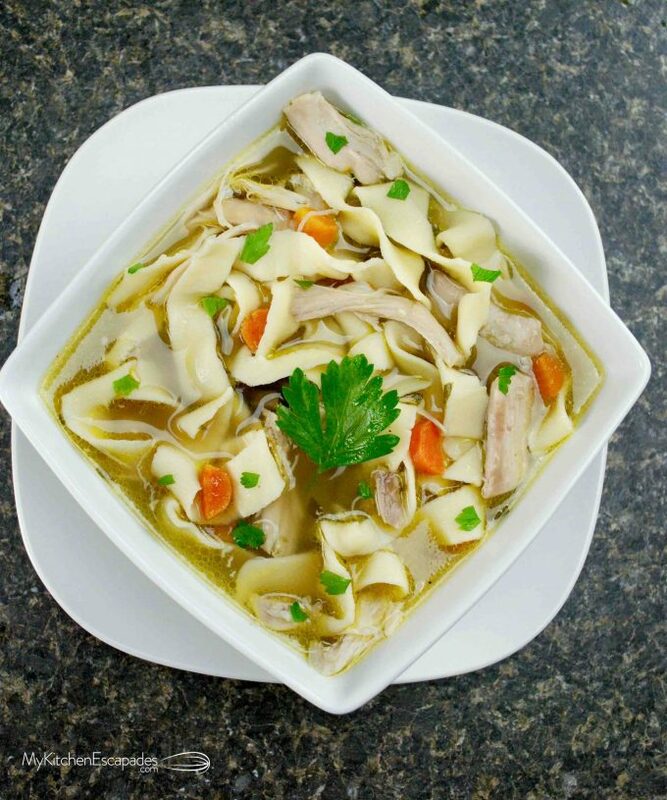 Homemade Chicken Noodle Soup is my all time favorite from scratch soup recipe. When the evenings get cold, this stuff makes you feel fabulous, especially because of the homemade noodles. Don’t be afraid to make your own noodles at home because once you do, you will never settle for anything less than homemade noodles in your chicken noodle soup recipe. 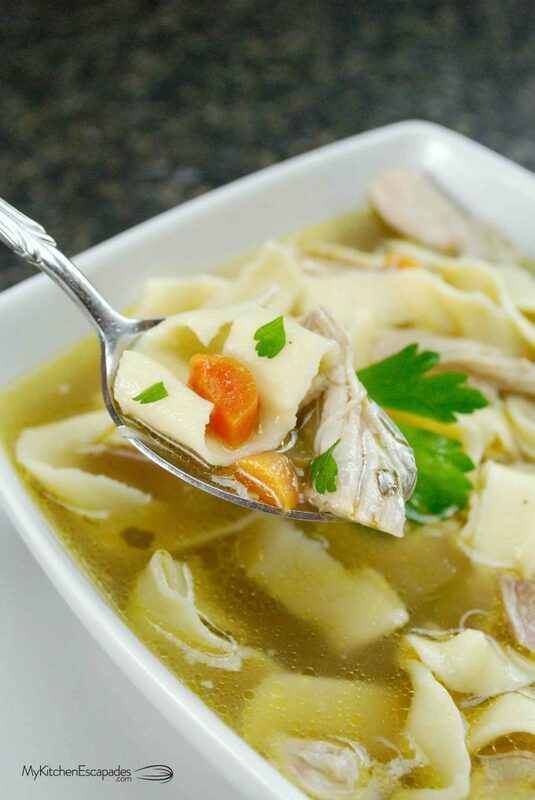 The other secret to the best homemade chicken broth is the type of chicken you use, so scroll on down to see which cut will give you the best flavor…. I adore living in Minnesota. Really I do. However, as the winter season begins to get closer with the dangerous cold temps we experience, I have begun to doubt my adoration. When a wind chill is -40, there is no choice but to hunker down inside and drive each other crazy with too much togetherness. While it is still fall, this week brought our first couple nights of needing to run the furnace. That always makes me a bit sad. 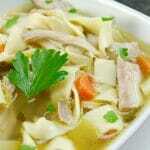 One bowl of my homemade chicken noodle soup and I was feeling better instantly. I like my soups more on the stew side, which means I like them light on the broth and heavy on “the stuff”. And what makes “the stuff” out of this world are my homemade noodles. If you haven’t had homemade noodles in your chicken noodle soup, then come up to Minnesota and let me spoil you a bit. They are worth the drive. Honest. If you don’t want to roll out your noodles by hand, you can pick up this inexpensive pasta machine for just a few bucks. Believe me, once you make your own noodles, you are going to want to make them all the time. 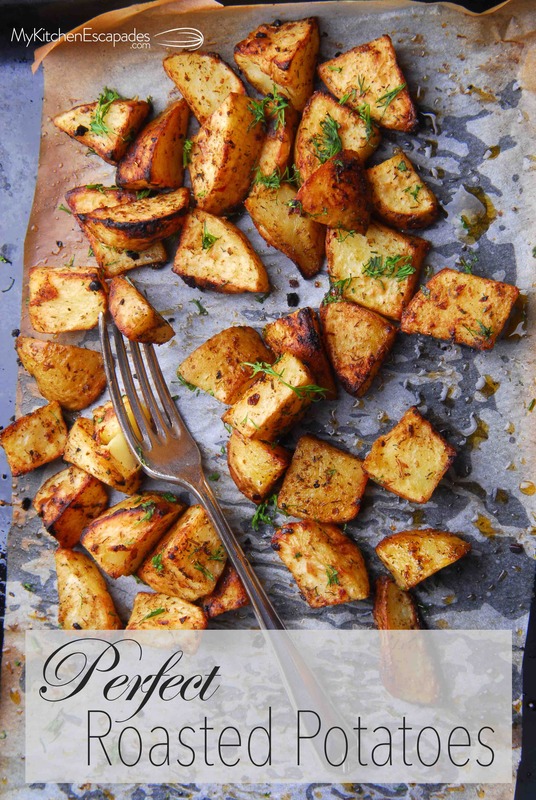 Don’t be intimidated by this recipe. It is easier than you think with just a few steps. Check out my video to see it made right before your eyes! 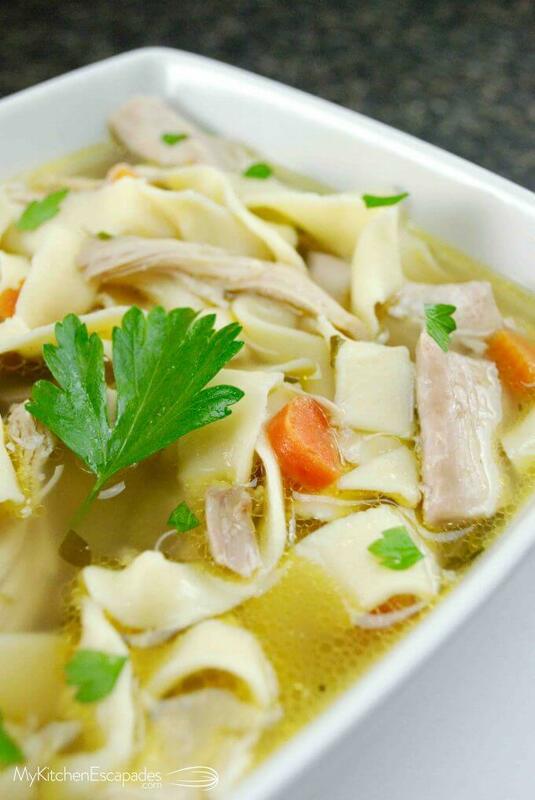 If you desire a simpler version, you can always use prepared chicken broth and cooked chicken, then add the homemade noodles. However, the result from scratch really, really is worth your time and effort. Have I ever lead you astray before? Looking for another amazing soup recipe for these cold nights? 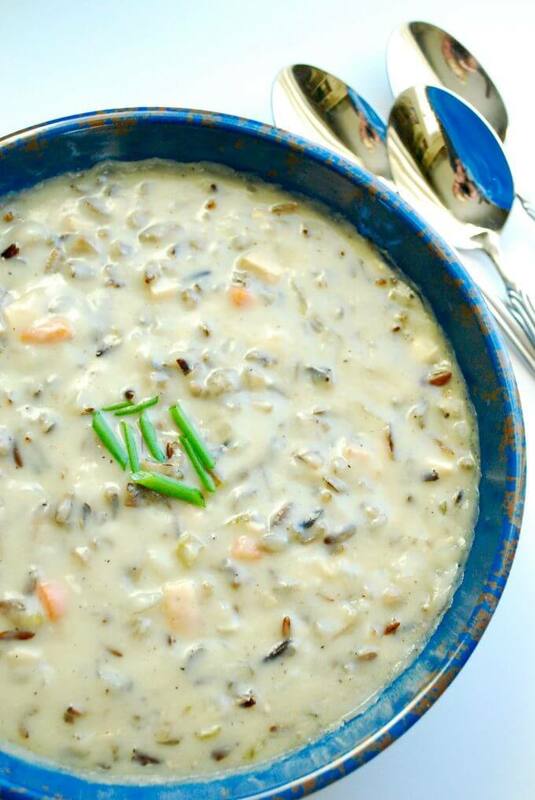 Go over and print out my kid’s favorite Creamy Chicken and Wild Rice Soup recipe before you forget! This from scratch soup recipe is amazing and the homemade noodles just take it over the top! Perfect cold night dinner. 1. Mix together the flour and salt. Make a well in the center, add the eggs. Gradually mix in the flour to form a dough. Add any additional water if needed to make a stiff dough. Knead the dough until it comes together. It will not be soft like a bread dough. It will be stiff. 2. 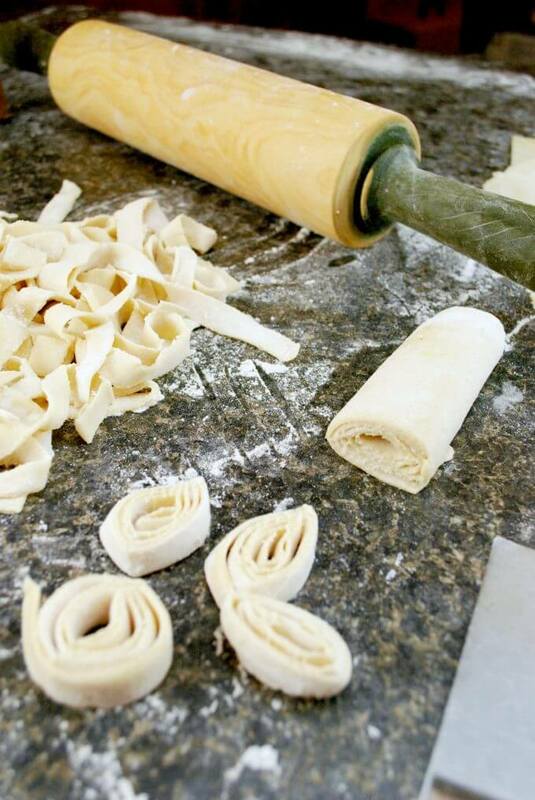 On a lightly floured surface, cut the dough into quarters and roll to 1/4″ thick. Roll up the dough and use a knife to cut into skinny slices. Repeat with the other pieces of the dough. Cook the noodles in a large pot of boiling, salted water until al dente. The time will depend on the size of your noodles but should take around 2-3 minutes. Test them for doneness until they are al dente. Drain and set aside. 1. Heat the oil in a large stock pot over medium high heat. Add the onions, garlic, celery, carrots, mushrooms and parsley to the pan. Generously salt and pepper the vegetables and saute over medium high heat until the vegetables have softened, about 5-7 minutes. Add the chicken, water, bay leaves, red pepper flakes, salt and pepper. Cover and bring to a boil. Once it comes to a boil, reduce the heat to low and allow to simmer for 1 hour. 3. Turn off the heat, remove the bay leaves and discard. Remove the chicken and allow it to cool slightly before removing the cooked meat from the bones and chopping it up. Add the cooked chicken and noodles back into the soup. Taste the broth and add any additional salt and pepper as needed. I usually find I need to add more of both! As the noodles sit in the broth, they will absorb the broth so wait to add them until you are ready to eat. OMG! This is almost like my husband’s grandmothers recipe, without the garlic. Thank you for posting this, as I remember the house use to smell like thanksgiving,love that! First of all, kudos to you for living in freezingland! This was a great recipe for noodles, thanks you! I used it to make turkey noodle soup today with the last of the Thanksgiving turkey. It was delicious. By the way, I’m about as far south as one can get at the Gulf of Mexico. I appreciate the comfort of good warming food on a cold day too…it’s 66*, lol! I am going to try your recipe. I live in Wisconsin and it’s feeling cold here too. Oh this soup looks so good! Have you made a large batch and froze it with good results? I’m looking for chicken soup to freeze and get out during a sick day. Thank you! This was SO ridiculously spicy that I had to rinse everything off and start over. 3/4 tsp red pepper flakes is WAY WAY too much. Definitely cut back on that and the recipe is pretty good. Oh yes! I too am from Minnesota and its the perfect day for soup! I have my own soup recipe that Ive been using for a while now but the noodles ive been dying to find a good noodle recipe! 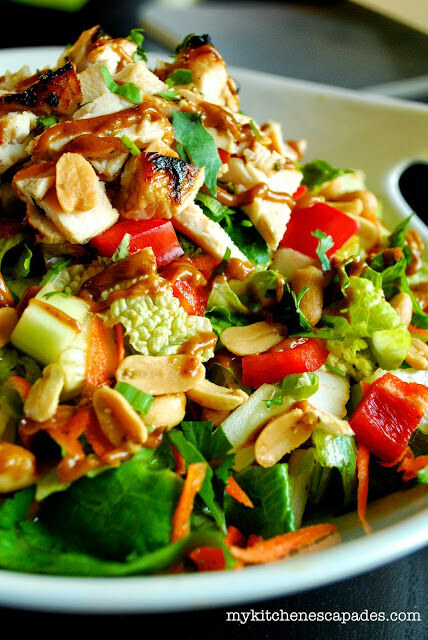 Ill be making this today! Thank you! i have made homemade noodles many times. My question to you, is why not boil the noodles in the broth with the soup? It adds a lot more flavor to the noodles! Great question Barb! You certainly could but you would need a lot more broth than what this recipe makes. The fresh noodles absorb a lot of liquid and there would be no broth left for your soup. I am making the noodles for soup tonight- my own variation of soup- can I make these noodles and freeze? Now long before soup is done before I need to add noodles? We edited the recipe – initially put in the full teaspoon of salt in the noodle recipe . That proved way too salty. Choice was to start over or fix – we added more flour., water & another egg to cut the aggressive salt. Where ever the recipe suggests you be ‘generous ‘ w repeated salting – I cut that back to a pinch – you can always add salt – hard to fix a dish when it’s got too much salt. We added 1 teaspoon of the red pepper flakes rather than the 1.5 tsp. and that was still overpowering – choking. to an extent. 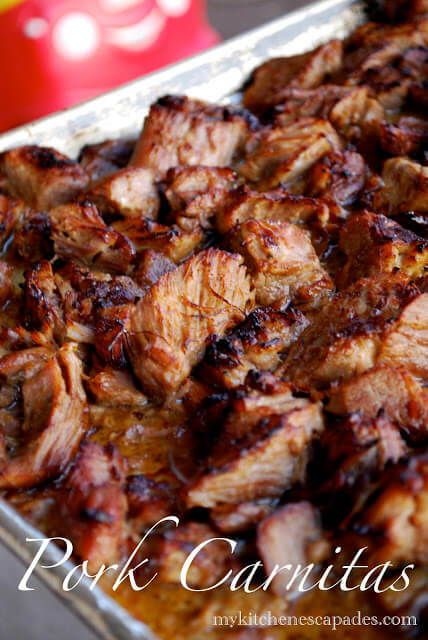 My hubby is making this for me tonight as I have the flu. I’m from WV and my grandmas would make homemade chicken and noodles for us all the time. Because of this, I can’t stand when I see a “homemade” chicken noodle soup using store bought egg noodles. Gross, imo. Now I live in New Mexico and I’m excited to put the chili flakes in the soup. It’s a variation I hadn’t seen and one that should help clear my sinuses. 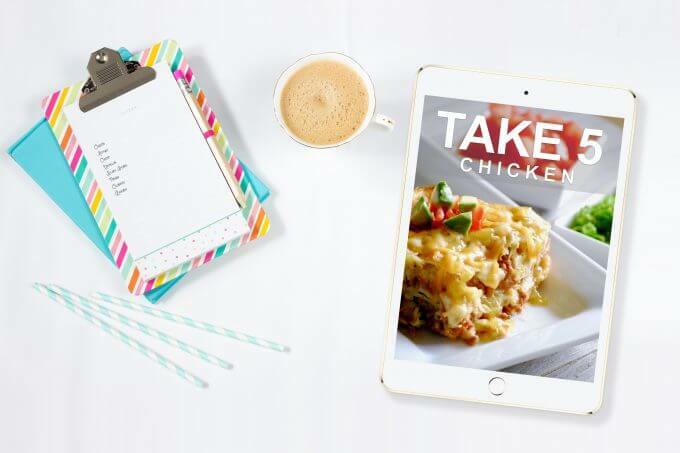 Can’t wait to try your fabulous recipe. 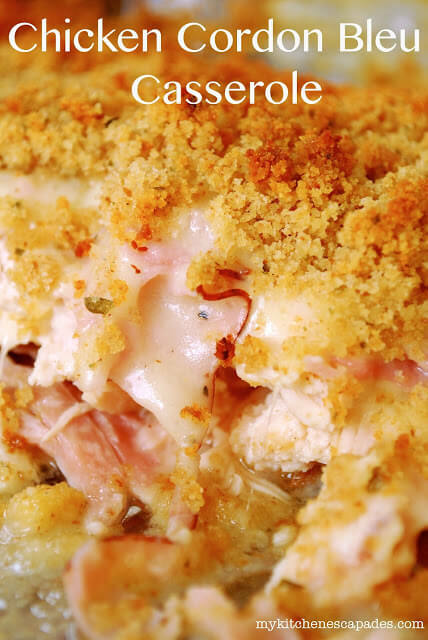 Not sure if you’ve ever had chicken and noodles, but you boil a chicken in broth and add your homemade noodles and your favorite seasonings… you don’t want it to be soupy, you want it to be a stew and then serve over mashed potatoes… amazing! I hope this recipe gets back up in your feet Amber! Im wanting to make a big batch of the noodles to freeze for later. How long do you recommend drying them for before putting them in the freezer? I would let them dry just long enough that they won’t stick together, so about 10 minutes so the outer layer dries a bit. Good luck!